Moses brought the people out from the camp to the foot of Mount Sinai. In the morning of the third day there was thunder and lightning. All the mountains shook and gave out smoke like a furnace. A trumpet sounded loudly. God began to speak from the cloud. “I, the Lord, am your God. You shall not have other gods besides Me. Moses is one of the best-known people of The Holy Bible. He played a key role in the Exodus, and later he received The Ten Commandments from God (twice - he smashed the first set when he discovered the Israelites running wild at the foot of Mount Sinai i.e. Exodus 32:19 and 34:1). He directed the construction of The Tabernacle and The Ark Of The Covenant. He is also the author of The Pentateuch, the first 5 Books of the Bible - Genesis, Exodus, Leviticus, Numbers, and Deuteronomy. To escape the Egyptian king's edict to kill all male Hebrew infants (Exodus 1:15-16), Moses' mother Jochebed and sister Miriam (Mary is the Greek form of the Hebrew name Miriam, an interesting coincidence since Moses was the deliverer of God's physical people, just as Jesus Christ is the Deliverer of God's spiritual people - and both spent their infancy in Egypt put him in a waterproof basket, and set it adrift in The Nile River (Exodus 2:3-4). The basket was found by the Pharaoh's daughter, who adopted the infant. She named him Moses, because, "I drew him out of the water" (Exodus 2:5-10). Moses was raised in the palace of the Pharaoh where he was educated in "all the wisdom of the Egyptians." After he had grown up, Moses killed an Egyptian who had been abusing a Hebrew (Exodus 2:11-12). When Pharaoh learned of the killing, he tried to kill Moses, but Moses fled for his life into the desert of Sinai (Exodus 2:14-15). There he met Jethro, a priest of Midian. Moses married one of Jethro's daughters, Zipporah (Exodus 2:15-22). When his time of training was completed, God appeared to Moses in the burning bush and gave him his mission - the Exodus (Exodus 3:1-22). Moses was 80 years old at the time of the Exodus. He had spent 40 years in the palace of Pharaoh (learning how to govern), and 40 years in the Sinai (learning how to live in the Sinai wilderness) - all in preparation for his third 40 years, which would be spent on The Wilderness Journey. Moses is considered the Hebrew prophet and lawgiver and founder of Israel, or the Jewish people. The dates of Moses’ birth and death are hard to establish. Many contemporary authorities believe that the exodus took place in the 13th century BC. Revered as a prophet but even more importantly as a teacher and a lawgiver, Moses was the leader of the Israelite people during their journey from slavery in Egypt to freedom as a nation in the land of Israel. For 40 years Moses led the people through the desert on their way to Israel and helped shape them into a nation that could live under the laws of God. Moses oversaw the creation and development of the first Israelite systems of worship, the anointing of the family line of his brother Aaron as priests, and the creation of a legal system of governance for the community. Ancient Israel had a long oral tradition of laws and legends, and it is likely that some parts of the story of Moses were written long after his lifetime. Modern scholarship recognizes that while the core of the biblical story of Moses contains real history, there is disagreement as to the accuracy of every action and every word attributed to Moses by the biblical writers. Whether one views the Bible as the revealed word of God or as the writing of inspired people, the figure of Moses towers over the early history of the Jewish people. 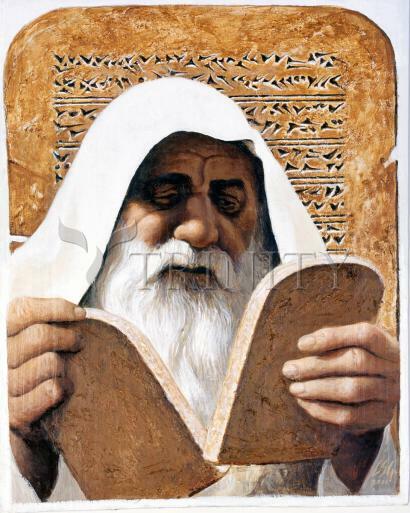 Jewish, Christian, and Muslim traditions revere Moses for his central role in communicating the Ten Commandments and the Torah (the first five books of the Bible) directly from God to the Jewish people soon after their escape from Egypt. Thus the Torah is also known as the Five Books of Moses. According to Genesis, the first book of the Bible, the Israelite people first came to Egypt in search of food during a famine that affected the entire ancient Near East. At first welcomed by the Egyptians, after about 400 years the Israelites, or Hebrews, were perceived as a threat and were enslaved. In addition, the Pharaoh, the ruler of Egypt, decreed that all newborn male Israelites were to be killed. It was at this time that Moses was born. His older siblings, Aaron and Miriam, would join him later in his life to help lead the Israelite people. Moses was saved from death when his mother, Yocheved, floated him down the Nile River in a small basket, where he was discovered and saved by the daughter of Pharaoh. The name Moses is actually an Egyptian name. Little is known about the childhood of Moses. Following his adoption into the royal household the Bible next mentions him as an adult who killed an Egyptian taskmaster for abusing an Israelite slave. Forced to flee Egypt, Moses became a shepherd in the neighboring land of Midian, where he met and married his wife, Zippora. While tending his flock, as the Bible relates, Moses had his first encounter with God, who would ultimately free the Israelite people from Egyptian slavery. At a bush that miraculously burned but was not burnt up, Moses heard God call him to go to Pharaoh and demand that the Israelite people be set free. At first reluctant and afraid, Moses was convinced by a series of divine signs and was reassured by the presence of his brother Aaron, who came to assist him. Moses' first confrontation with Pharaoh was a failure. The Egyptians relied on slave labor for their massive building projects, and Pharaoh was reluctant to lose such a large number of workers. Angry with Moses, Pharaoh decreed that the Israelite slaves should work even harder. The consequent increasing oppression of the Israelites caused them to reject Moses as their deliverer. The Bible then tells of God's visiting upon the Egyptians a series of divine punishments in the form of ten plagues. The final plague took the life of Pharaoh's own son. Pharaoh then relented and let the Israelites leave Egypt under the leadership of Moses. But Pharaoh soon regretted his decision and set out in pursuit with his army to bring the Israelite slaves back to Egypt. At the Sea of Reeds, with the Egyptians closing in on them, the Israelites miraculously passed through the divided waters to freedom, while the Egyptians were drowned. Moses and Miriam led the people in song and prayer, the words of which are preserved in the Bible in the Book of Exodus. As the Bible next describes, Moses then led the Israelites to Mount Sinai, where God gave them the Ten Commandments and other laws contained in the Torah. Through these laws, God is said to have established a covenant with the Israelite people. The Israelites pledged to follow God's laws, and God promised to be their God forever. These laws were intended to establish the moral principles by which the new Israelite nation would govern itself and through which it would manifest God's hope for just and right relationships among people. When Moses first came down from Mount Sinai he saw that many of the Israelites had made an image of a calf out of gold, which they were worshiping. In his anger, Moses smashed the tablets containing the Ten Commandments. God was prepared to abandon the people for the sin of idolatry, but Moses interceded on their behalf. Soon after, he went back up Mount Sinai and was given a second set of the Ten Commandments. Moses next prepared to lead the people from Mount Sinai to the promised land of Israel. However, the Israelite people, accustomed to slavery and uncertain of freedom, soon rebelled against God. They became convinced that they could not conquer the new land, and they constantly questioned Moses' leadership and their own faith in God. As a consequence, the generation that left Egypt was not allowed to enter the Promised Land. The Bible describes Moses himself as once losing patience with the people and seeming to doubt God: rather than speaking to a rock to get water as God commanded, Moses struck the rock with his staff. For this, Moses was also destined not to enter the new land. Near the end of his life, Moses taught the laws of the Torah to the new generation that had grown up in the desert. He then transferred leadership to Joshua. The Torah ends with Moses' final blessing to the people, after which he ascended Mount Nebo, which is identified with Mount Pisgah, on the eastern edge of the Jordan River. Moses died there, able to see, but not to enter, the Promised Land.